← Are we being ripped off if VAT-free ‘children’s’ clothing only goes up to age 12? OUR boys are always nursing some injury or another – stop! Don’t ring social services, they are boys, and they play sport. I wouldn’t want to generalise and say boys get more scrapes than girls, but having three sons one after another it seemed from the moment they could walk they were scraping knees and elbows. While we’ve been lucky enough so far (*touches wood) to avoid any broken bones, Jed has a large scar on his elbow plus one on his eyelid, Dougie has several on his knees, plus one on his eye, and Billy Whizz seems to be attempting at every opportunity to get a scar of his own. But while the boisterous boys will expend their energy on the rugby pitch, their self-appointed princess of a sister has her own daredevil streak and is constantly trying to climb things that shouldn’t be climbed or stand on tall objects. However it was rugby that gave her a major cut recently, not playing it yet, but falling flat on her face while we were watching Dougie play. 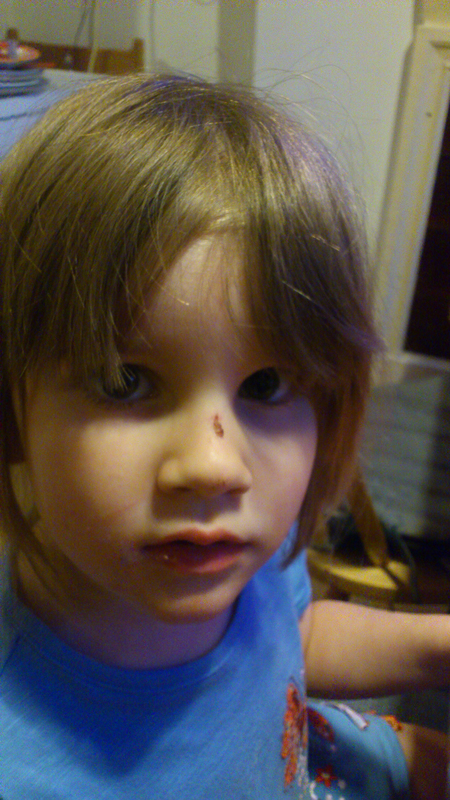 For some reason she didn’t put her hands out to stop herself and ended up with a cut on her nose and a grazed chin and lip. While I was obviously concerned, I found myself fussing about potential scarring, and guilty that I was more worried about our daughter having a scar than I’d been about our sons. Boys can wear scars and scabs with pride. Girls get neurotic and self-conscious about them. Especially when they are right in the middle of your nose. She’s not bothered, although when I said she mustn’t pick at it or she’d get a scar on her nose, she was instantly concerned. I’d forgotten that to a four-year old, Scar is the baddie in the Lion King . .